It’s amazing when a problem results in a clever invention. This is the case with an innovative tourism campaign from Visit Faroe Islands. Frustrated by the lack of Google Street View for the islands, the tourism board decided to take matters into their own hands—and hooves—by attaching solar-powered 360-degree cameras on several of the islands’ 80,000 sheep. The end result offers tourists, residents, and even Google Street View a unique look at its ruggedly beautiful terrain. If you’re unsure of where the Faroe Islands are, you’re not alone. The Faroe Islands are a remote archipelago of 18 mountainous islands located halfway between Iceland and Scotland in the North Atlantic Ocean. According to Visit Faroe Islands, travelers use Google Street View as they plan their vacations, so not being featured is a disadvantage. However, because many of the best parts of the Island are not on the actual roads, enlisting some of the island’s 80,000 freely wandering sheep offers a creative solution to their problem. To take this clever concept from idea to execution, Visit Faroe Islands enlisted subject matter experts, including a shepherd and an inventor, to fashion a solar-powered 360-degree camera fit for an adventurous sheep. The camera takes a photo every minute. The Visit Faroe Islands team has also been using Sheep View 360 to capture video. The results of the Sheep View 360 video footage are pretty amazing. The viewer is instantly transported on top of a sheep (which is often in motion!) and can experience the beautiful scenery they freely roam. As it’s a 360-degree experience, the viewer can also control their view and direction to see different angles. As the campaign has taken off, it has been covered by news outlets around the world. Durita Dahl Andreassen, a project manager for Visit Faroe Islands, has emerged as a friendly face and ambassador. However, Visit Faroe Islands has not forgotten its original mission of bringing Google Street View to their remote part of the world. Enlisting the use of the appropriately named hashtag #wewantgooglestreetview, Visit Faroe Islands continues to use social media, sheep, and even ships to spread the word, while helping Google Street View along the way. So what can you learn from this clever campaign? Part of what makes this effort so memorable is how Visit Faroe Islands didn’t just create a campaign—they brought their story to life. Stories are more memorable because they tap into our feelings and emotions, forging a more personal experience for the recipient. From the decision to make Durita the face of the program to her sweet intro and first person narrative, each video becomes a new chapter, offering the audience incentive to follow along as the story unfolds. Another good lesson here is to embrace your inner MacGyver. For those not in the know, MacGyver is a 1980s action-adventure TV character known for his ability to use random objects to thwart the enemy and solve problems. There’s something magical about thinking creatively about how to solve problems with the resources at your disposal. There’s also something to be said for boldly testing and learning to solve problems. The sooner you start to think outside the box, the more you will push yourself and your colleagues to develop and test innovative new ideas that could result in important breakthroughs for your company. As of press time, Google Street View has not confirmed whether it will come to the Faroe Islands to help the tourism board complete its project. However, even without Google’s help, Visit Faroe Islands has successfully turned a grassroots campaign into a global sensation that has raised awareness for the islands as a travel destination. The campaign comes at a time where tourism has been steadily increasing, with a reported 30 percent increase in visitors over the past four years. However, it’s worth noting that while the Faroe Islands continue to grow in popularity as a travel destination, it’s not without some controversy. Grindadráp, an annual whale hunt ritual that produces some graphic images, attracts outcry from would-be travelers and activist groups alike. 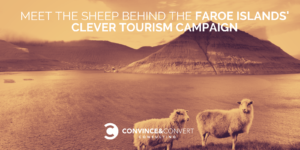 Even with campaigns as successful as “Sheep View 360,” there are a number of comments published on the otherwise positive news articles expressing objection to the event and discouraging travel to the Faroe Islands. As Visit Faroe Islands continues to grow its social media presence and launch new campaigns, it is something they will need to consider.